Do you remember Myst? That mysterious 3D computer game from the 1990s where you walked around solving puzzles? Well, believe it or not, the folks over at Disney were in talks with the creators of Myst to turn it into a theme park down in Florida. No joke. The AV Club has a new interview with Rand Miller, one of the masterminds behind the groundbreaking computer game. Miller claims that the old rumors are true, Disney had indeed approached them about creating Myst Island in or near the Walt Disney World resort. AVC: Is it true that you and Disney were working together at one point to make a sort of real-world version of Myst Island? RM: That was absolutely true. At some point, there were some really cool plans to do some stuff with Disney. We were looking at it as the ultimate incarnation of our world. Basically, there was a place down in Florida—it’s one of the island areas that they had that wasn’t used very much. But it had some walkways among trees, and an island area, and we went down and looked at it and walked around it, and it was incredibly Myst-like. It was perfect for Myst. So we were all excited. Their imagineering team was excited about embracing that and building some stuff into it and tying it into the rest of the park, where you could explore and have this real-world experience. But, the way Disney works, and the way it had to fit in with their bigger scheme of things, and the way we didn’t understand pieces of it, I think it fell apart from their point of view. That was a very exciting time. It was cool to try to pull that off. Of course, it’s not hard to see why turning Myst into a real world place to explore might be confusing. If you’re not familiar with the game, the setting would just be an island. And the puzzles would have to cater to tens of thousands of people buzzing through each and every day. 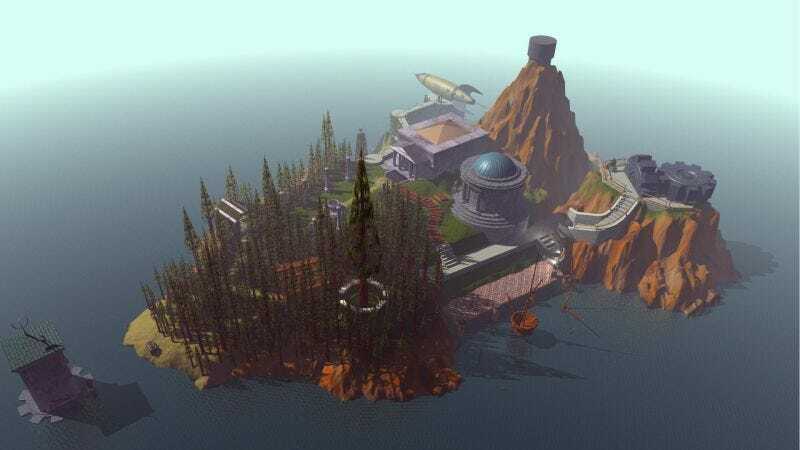 So it’s not exactly a surprise that Disney’s Myst theme park (or Myst “land”) never made it beyond mere talk, but it’s interesting to dream what it might have looked like.